3 - 3..................Fosc de los Valientes. 3 - 3..................Ondra von Norden Stamm. 5,6 - 5,5,6.........Ali von Langenhorst. 5,6 - 6...............Nimrod Hilo vom Franckenhorst. 5,6 - 6...............Don Dayan vom Franckenhorst. Von Roth Anka was a substantial female with good nerve and territorial aggression coupled with balanced drives and a calm hard grip. 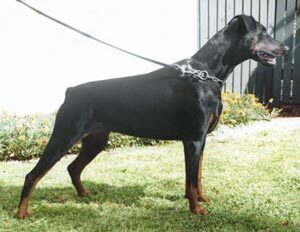 Udine: dam of the Vonforell “A” litter (Armin).